Rugby Town enter the final month of their first ever United Counties League Premier Division campaign this Saturday with the visit of Cogenhoe to Butlin Road. Valley’s penultimate home outing of the season represents another free admission opportunity for local sports fans, and Town Director Neil Melvin explained the rationale behind this latest offering. He said: “Following the success of a similar initiative for the Kirby Muxloe game at the end of January where the response was very encouraging, we have decided to open up the gate for free again. The Kirby promotion attracted a crowd of 450 people to the ground - a total more than two and a half times the size of the previous home game’s attendance, and whilst the UCL Premier title is almost certainly now beyond Carl Adams’s side, Melvin stressed that the manager certainly wants to end his first season at the club on a high. He added: “There are still 15 points to play for this season, and Carl is focused on achieving as good a finish as we can. 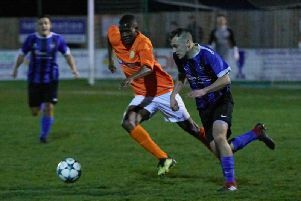 A Charlie Evans double ended the resistance of a Boston Town side that had limited league leaders Daventry to a solitary goal victory in its previous match. Evans’s two goals came either side of a Boston leveller in a game described by Adams as “not pretty”, but unlike the previous weekend when Sleaford frustrated their visitors in securing a draw, this time Valley were able to dig in for the points. 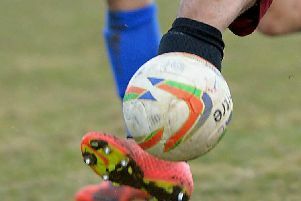 Rugby remain in third - four points adrift of Deeping, who enjoyed a 2-0 success at Leicester Nirvana, whilst Daventry had no fixture last weekend. The Northamptonshire table toppers kick-off their tough run-in on Saturday with a trip to 5th placed Holbeach, whilst Deeping travel to Northampton ON Chenecks (in 15th). The Boston win reduced the gap between Rugby and Daventry to ten points, with the two sides set to meet at Communications Park on Easter Monday (22nd April). Daventry then visit Deeping as part of the final set of fixtures at the end of that week. Saturday’s visitors to Butlin Road Cogenhoe currently sit in sixth place, and come into the game in good form with just one defeat (and six victories) from their last eight outings. Town triumphed by a 3-2 margin in the reverse fixture between the two sides at Brafield Road back in January, with Fazel Koriya (2) and Lewis Rankin on target for the visitors. The league’s transfer deadline at the end of March passed without any new arrivals at the club, although Adams has recently added academy strike duo Lewis Padmore and Kyle Tott to his registered roster for the remainder of the campaign.